During the prelude to his town hall this Thursday, January 3rd, Oregonian Senator Jeff Merkely was joined by three youth leader representatives – Sage Rasmussen, Bianca Curtin, and Aravind Sriram – from YouCAN whilst he recogn ized our work and presented us with the American flag that previously flew aloft the State Capital, symbolic of this honor. The Gazette-Times addressed this matter in an article; “Following his usual practice, Merkley took a moment… to recognize the efforts of a local organization doing good work in its community. 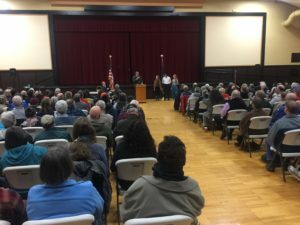 In Philomath, it was the Corvallis chapter of Youth Climate Action Now, or YouCAN, an offshoot of Our Children’s Trust working on climate issues.” – We could not be prouder.